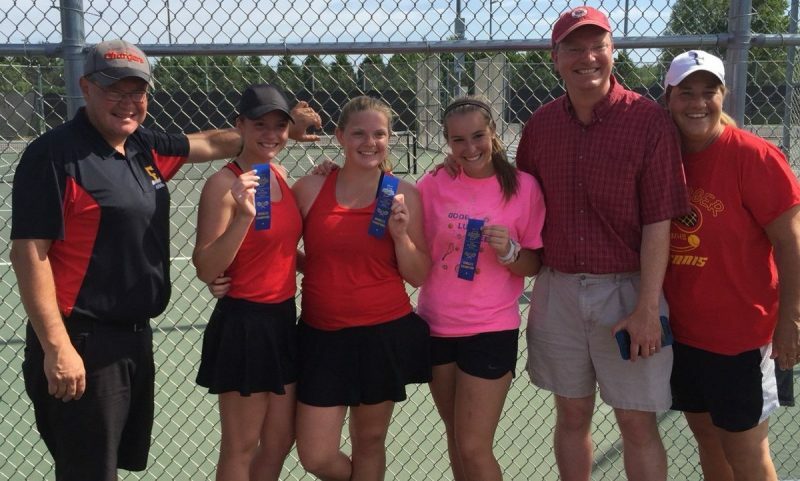 LAPORTE – The Elkhart Memorial girls tennis program reached some new heights Saturday. The Chargers, thanks to a strong showing in the singles and doubles portion of the LaPorte Regional, will be well-represented at the State Finals. Memorial standout Krystal Grubb earned a return trip to State at No. 1 singles with a pair of wins Saturday. She will be joined at State by teammates Maggie Dickerson and Layla Jojo, who on the No. 1 doubles title. Grubb continued her unbeaten senior season by downing Lanae Singleton of Plymouth in the semifinals and Carla Jewell of Hobard in the championship match. Grubb beat Singleton 6-2, 4-6, 6-3 in their third meeting this season. She then rolled past Jewell 6-0, 6-4 in the final. Grubb improved to 25-0 this Spring and also became Memorial’s all-time singles victory leader Saturday. She is now 88-9 in her career, passing her sister Katie. The elder Grubb, a 2009 EMHS graduate, was 86-9 in her high school career. Krystal Grubb will play at IUPUI next season, while Katie played at Bowling Green. Grubb advanced to the quarterfinals of the State Finals individually last year. She was also the No. 1 singles player for her team when Memorial advanced to the State Finals as a team three years ago. Dickerson and Jojo proved their toughness not once, but twice on Saturday. The Chargers’ top doubles team rallied from a set down to win a pair of matches. The Memorial duo beat Rachael Dodson and Harshita Sangaraju of Culver Academy 2-6, 7-6, 6-4 in the semifinals. Dickerson and Jojo then rallied to beat Joselyn Bobos and Madison Jusevitch of Lowell 1-6, 6-2, 6-3 in the final. Senior Dickerson and junior Jojo are now 12-4 together on the season. Plymouth’s Singleton finished 25-4 in her senior year with three of those losses to Grubb. Jewell, a junior, was 18-3. The Culver Academy doubles team closed at 17-5 and the Lowell duo was 16-5. The trio of Grubb, Dickerson and Jojo achieved a Memorial tennis first Saturday. It marked the first time that the program had ever had players qualify for both the individual singles and doubles regionals in the same season. The State Finals are set for Friday and Saturday at Park Tudor High School in Indianapolis.